Outer space is a very cold place, especially if we're talking about sci-fi MMO EVE Online. Despite its cutthroat reputation, however, EVE players have proven themselves astonishingly generous by donating $190,890 (!) to the Icelandic Red Cross's Typhoon Haiyan relief efforts in the Philippines. Starting November 20, the money started pouring into EVE's PLEX for GOOD program, which lets players donate in-game PLEX -- which has a real-world value of $19.95, or about 30 days of game time -- to specified charities. Players had already donated a crazy amount of PLEX from the start, but it really ramped up on December 7 when CCP, EVE's developers, started to Twitch a live stream telethon. CCP held various staff events, ranging from arm tattoos to male and female head shaving to getting shot with a paintball for every $2,000 raised. Suffice it to say, some EVE developers ate a lot of paintballs that night. Also, EVE players love them some EVE, but giving away $190,890 worth of PLEX means they just donated the equivalent of 1,060 years of game time. CCP is speechless. In early November 2013, Typhoon Haiyan beat up Southeast Asia, but in particular it ripped right through the center of the Philippine Islands. Over 6,000 people died, another 27,000 were injured, and tens of thousands more had their homes flattened or carried right off in the wind. Our thoughts and prayers continue to go out to those affected. Reykjavik, Iceland -- 11 December 2013 – CCP, the world’s leading independent developer of massively multiplayer online (MMO) games, today announced that the players of its game EVE Online have donated US$190,890 to the Icelandic Red Cross to help the citizens of the Philippines recover from Typhoon Haiyan. 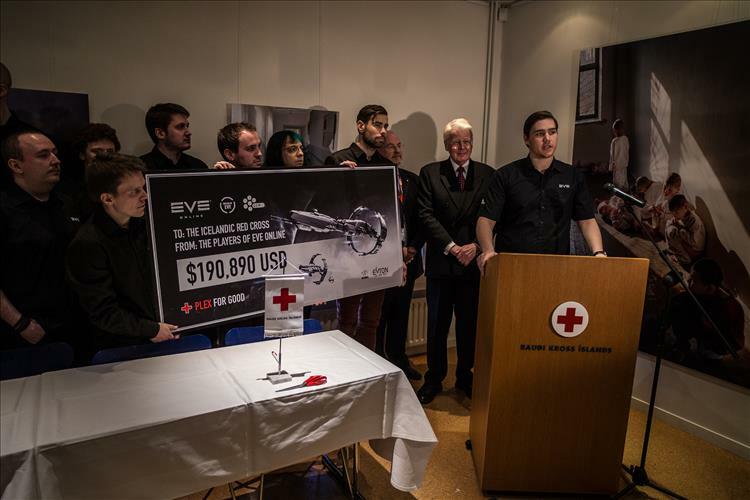 The money was raised through the “PLEX for GOOD” program, which allows players of EVE Online to collectively donate in-game currency to worthy charities, as well as other associated donations. During the PLEX for GOOD drive the EVE community banded together in dozens of unique player-run efforts to donate 12,726 PLEX (approximately 1060 years of playtime) to total US$190,890. The drive culminated on December 7 in an 8+ hour “telethon” live-streamed on Twitch (www.twitch.tv/ccp) featuring EVE Online developers who pledged unique donations as fundraising milestones were hit, including developer boxing matches, male and female head-shaving, getting a full-arm tattoo, sparring versus a Tae Kwon Do champion and even getting shot with one paintball for every US$2,000 donated. Other programming included a guest appearance and “training session” by mixed martial arts phenom Gunnar “Gunni” Nelson, a developer cooking competition, Q&A sessions and a live sampling of the most exotic tastes of Icelandic cuisine. While the interactive content of the telethon was on the lighter side, the heartfelt thanks from CCP’s development staff to its players is very sincere. Every milestone was reached and well surpassed. Coupled with the other PLEX for GOOD efforts, EVE Fanfest silent auctions and other associated charity drives, the EVE community has raised a total of over US$340,000 for charitable causes since EVE was released on May 6, 2003.